So as many people know Outlander is a new series on Starz, and if you have watch the Series then you know that there are books, that the show is base on. 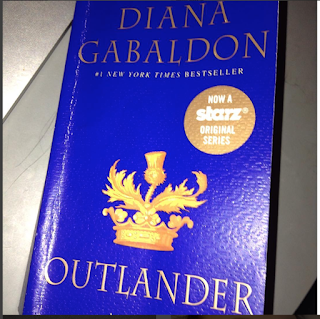 Well I am here to provide you with a review on book one of the Outlander Series by Diana Gabaldon. Two thing before my review of the book. One is that you need to read the book, the show provides only half of what is in the book. The second thing is that these books are far more descriptive then the show, so that makes them more enjoyable. Now on to the review. The book starts out with the reader's mind in 1945 Scotland. The war has just ended for our two character Claire Randall One day she ends up at some mysterious rocks, and which some how causes her to end up in Scotland 1745. She ends up with the Scots who think she is a spy. This business leads her into trouble so she has to married Jaime, one of the Scots she meets. Eventually she ends up back at the rocks to return to her time, which leads her to make a choice that will change her future. This is the beginning of Claire life. This book was enjoyable for me, So I have rated it a 4 out of 5 stars. Diana Gabaldon's attention to detail is amazing. She is the writer everyone else hopes to be as they write their work. So I will suggest any adult who loves the show, to absolutely pick up these books and read them. I will warn some of you though if you have an issue with Violence, or Abuse of any kind, please be mindful that these books carried a ton of that in them, to the point, that I was cringing. I cannot suggest these books enough for those who love the show or love other shows like Game of thorns, or books like Sarah J Maas Court of thorns and roses. This is a wonderful book and all information about where to buy it and its Author will be listed below.